Breakfast. Very early in the morning you will depart to Monteverde. Your 3 hours transfer starts with a bus trip, then continues by a relaxing boat ride through the Arenal Lake, from where you will admire the exotic wildlife that lives within this zone while enjoying the transition from the rain forest to the cloud forest, reaching the best view point of the Monteverde Cloud Forest Preserve and an impressive panoramic view of the Arenal Volcano. The scenic transfer ends on the other side of the Lake, where a bus ride will be waiting for you to take you to your hotel. 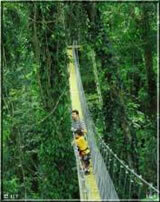 The Monteverde Cloud Forest Reserve is the main highlight of this place. It has a mystical forest containing a great variety of orchids, bromelias and birds. White beaches, abundant bird life, active volcanoes and magical cloud forests. Costa Rica is the ideal destination for the those seeking an exciting alternative to traditional vacations. This tour combines the highlight destinations of Costa Rica and offers travelers plenty of included and optional activities, allowing you to make your trip as active as you like. Choose from white water rafting, cave tours, a volcano hike, night turtle watching and more.